A few people have reached out to me to ask why their experience with making my homemade chocolate chip cookies from my cookbook have resulted in a completely flat result. One of the reasons why this happens is because there is too much fat vs. flour ratio. Since creating that book I have lost my trust in vegan butter’s capability in producing a consistent results (due to my own experiences) and have also realized that a recipe with a smaller amount of fat would work better. So off I went, back to my lab, to create a better result and better cookie. To those of you who have emailed me, these Salted Caramel Chocolate Chip Cookies are just for you. Of course, you can also simply omit the caramel and have yourself a good ol’ fashioned soft, chewy, pillow-y chocolate chip cookie. Problem solved. This recipe does call for non-hydrogenated shortening but if you do not have it on hand and don’t want to buy it or if you don’t like using it at all, you can use vegan butter instead. I really love the flavor that the shortening gives vs. vegan butter but that decision is up to you. Also note that your cookies will most likely be a little less puffy than these if you do go the vegan butter route. Shortening plays the role of keeping shape in a cookie recipe vs. vegan butter allows the cookies to spread a little more while baking. Then again you can also do a mix of 1/4 c. vegan butter and 1/4 c. shortening but that would just be mind-blowing, wouldn’t it? Preheat your oven to 375 degrees. Line a baking sheet with a piece of parchment paper. In a large bowl using an electric mixer, whip up the shortening and sugars together until well-blended. Add the flax “egg” and blend in. Add the vanilla and nondairy milk and mix until blended. In a medium bowl, whisk together the dry ingredients. Add half into the shortening mix and blend in with the electric mixer. Add the remainder of the dough and repeat. If your dough does not roll up into a ball and you find it crumbly, add another tablespoon of nondairy milk. Roll 1 tablespoon of cookie dough into a ball. Place 1 piece of the caramel into the middle of the ball and smooth over to ensure that it cannot be seen. Repeat for the remainder of the dough. Place on the baking sheet 2″ apart and bake for 10 minutes. Allow to cool down on the baking sheet for 1-2 minutes and then transfer to a wire rack. 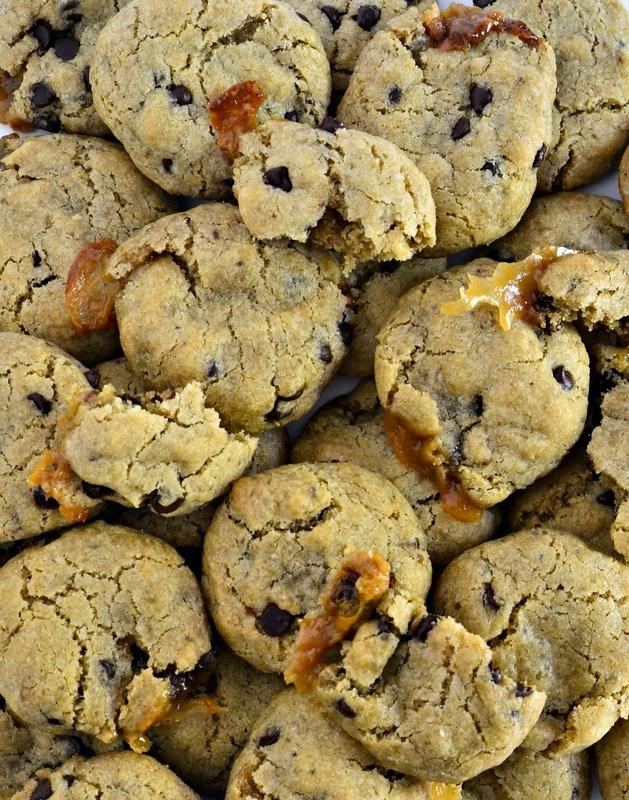 Some of your cookies will drool out caramel and that is completely okay. If that happens all you have to do is take a spatula and gently bring the caramel and cookie together and intact. Beware, these are dangerous baked goods to have in your house. I went door-to-door in my complex giving these away. They are simply too decadent to have in the house. P.S. There is a unit available here waiting to be rented. You could be my taste tester. Any takers? Need a good recommendation for a flour substitute? Check out this post to answer your questions. Never heard of Cocomels caramels? Look them up here, they are worth getting to know! Yes, the reason the didn’t turn out was because you placed them in the microwave! What do I think?? Delicious!! I made these for my gluten-free brother last week. They were perfect because not only was I looking for a recipe to make for him, but it also made use of my tub of shortening in my pantry! I thought that stuff would be in there forever. These cookies were moist, soft, and just perfect. I used cup4cup baking mix because I was a little lazy and short on your GF flour ingredients, but they still turned out delicious. Thanks for the great recipe. Can I substitute non-gluten free flour in this recipe? These cookies are pretty good. I used Earth Balance instead of shortening. I’m not a fan of really sweet desserts, so I completely cut of the white sugar (but included the full amount of brown sugar). I added pecans in the mix too. It yielded a nice, soft, but slightly crumbly cookie. Overall these are great and it will be interesting to try them again with shortening. Um! No words for these amazing looking cookies. I haven’t gotten your book yet (don’t worry, I asked for it for xmas! ), but that is a great tip about cookies. My GF ones NEVER turn out like I want them. Never! I wanna move in just to be your tester!!! I’m in Toluca Lake, so close yet so freakin’ far!!! I’ll just have to move! Great job on the cookies! I would eat them all and move to Cali. Sometimes we DO get what we prayed for, don’t we? And it is good! I have not seen those caramels. I wonder if they are available in my area. These cookies look divine. I used to love caramel. I bought them online and they are worth every penny! What do you sub for “flax egg” in your recipes? I have a kid allergic to flax… Any suggestions would be so helpful!! Thanks for your scrumptious recipes! I would opt for the EnerG egg replacer (or even chia) if that is acceptable. Let me know if that helps!